In two Facebook announcements during a 5-day period, Chef Ben Vaughn announced the closure of both of his Cooper-Young restaurants, Au Fond and El Diablo. El Diablo was open for less than a month when it abruptly closed April 28th. At the time, the announcement made on Au Fond's facebook page said that only El Diablo would close down and Au Fond would be downsized and moved into the El Diablo space. According to the statement on the Facebook page, "we love Au Fond too much to close, but we do need to (downsize)." The Facebook announcement claimed that Au Fond, which had been closed for about a week due to the Easter holiday and weather, would re-open on Saturday. But when the restaurant failed to open that Saturday, concerned customers continued to post questions on the site. 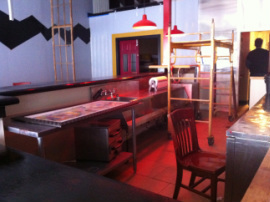 Then on May 3rd, Vaughn announced on Facebook that the popular Au Fond would also close. In the Facebook announcement, Vaughn stated that the restaurant was a "project that had to close." Vaughn's farm-t0-table restaurant, Au Fond, had operated for just 18-months but had become a staple of Cooper-Young residents for breakfast and lunch. This marks the third time Vaughn has opened and closed a Cooper-Young restaurant in a relatively short period of time. El Diablo had taken the place of Grace restaurant, a high-end white-tablecloth establishment that Vaughn opened and then shut down in less than a year. In December of last year, Vaughn cited in an interview with the Memphis Business Journal that he closed Grace because he wanted to focus on one restaurant.